Would “Ike” Like His New DC Digs? The life of President Dwight D. Eisenhower is closer to its permanent place of honor in Washington, D.C. The public got its first look at designs for the 34th president’s memorial on Thursday. Architect Frank O. Gehry’s vision includes woven steel tapestries depicting scenes from Eisenhower’s military and political career, as well as personal life. The large images would be presented high on limestone columns. The selected site for the National Eisenhower Memorial includes four-acres of land between 4th and 6th Streets SW, just south of Independence Avenue. The tribute to the man credited with ending the Korean War will be sitting just a walk from Korean War Memorial. Members of the Eisenhower Memorial Commission say the proximity of the chosen site to other major D.C. institutions are no coincidence. Just north of the site is Smithsonian National Air and Space Museum that holds special artifacts from NASA mission. Eisenhower created NASA in 1958. There will also be a grove of oak trees that members of the Eisenhower Memorial Commission say are meant to not only look beautiful, but also to also help preserve the historic view along Maryland Avenue. “The approach to the design was to create a cohesive and important civic space and urban monument in the heart of the capital region that provides a quiet and contemplative space for learning about the vast accomplishments of President Eisenhower,” said Frank Gehry. President Eisenhower’s grandson, who’s also a member of the Eisenhower Memorial Commission, says Gehry’s ideas achieved what he had hoped. “ His understanding of my grandfather’s accomplishments and legacy is remarkable, and he was able to translate the key theme of democracy into a compelling visual experience, “ said David Eisenhower. 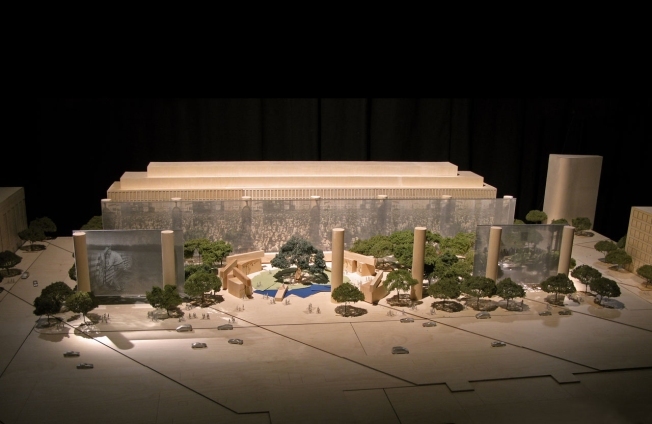 The Eisenhower Memorial will be the seventh National memorial dedicated to a U.S. president.